"I don't want to be a good man. I want to be a great one." 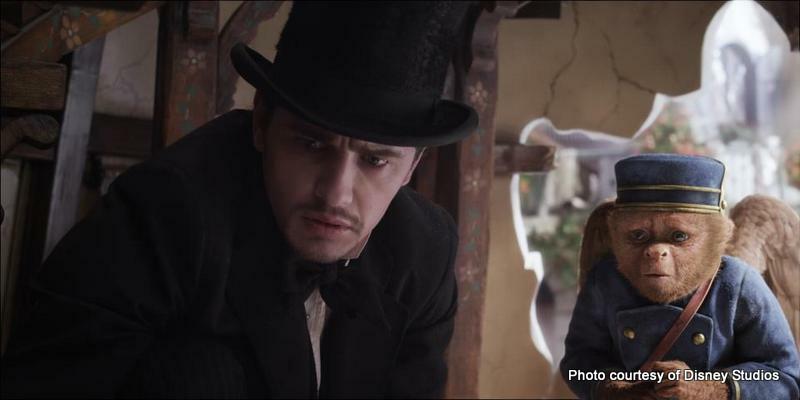 So says James Franco’s fraudulent wizard in “Oz the Great and Powerful", Disney's prequel focusing on the life of the titular Wizard of Oz. The synopsis of the movie sounded intriguing enough. Disney’s fantastical adventure “Oz The Great and Powerful,” directed by Sam Raimi, imagines the origins of L. Frank Baum’s beloved wizard character. When Oscar Diggs (James Franco), a small-time circus magician with dubious ethics, is hurled away from dusty Kansas to the vibrant Land of Oz, he thinks he’s hit the jackpot—fame and fortune are his for the taking—that is until he meets three witches, Theodora (Mila Kunis), Evanora (Rachel Weisz) and Glinda (Michelle Williams), who are not convinced he is the great wizard everyone’s been expecting. Reluctantly drawn into the epic problems facing the Land of Oz and its inhabitants, Oscar must find out who is good and who is evil before it is too late. Putting his magical arts to use through illusion, ingenuity—and even a bit of wizardry—Oscar transforms himself not only into the great and powerful wizard but into a better man as well. I don't know about you, but I remember spending a great part of my childhood immersed in the magic of fairy tales, and The Wonderful Wizard of Oz was one such fairy tale. After all, the likes of the Scarecrow, the Tinman and the Cowardly Lion were, and still are, iconic characters in their own right. So thanks to Disney Studios Singapore, I had the opportunity to attend a sneak preview of the movie before it opens islandwide today. Much like the 1939 Wizard of Oz classic, Raimi’s Oz the Great and Powerful opens with a lovely sequence set in a black-and-white Kansas, everything contained in an Academy-ratio box in the center of the screen. We meet Oz - short for Oscar Zoroaster Phadrig Isaac Norman Henkel Emmannuel Ambroise Diggs - who is a two-bit, skirt-chasing magician dreaming of bigger and better things. He gets into some kind of trouble with a strongman, and escapes by hopping into a hot-air balloon. Cue tornado. The Land of Oz then brings rapturous, saturated blooms of colour with trees bedecked in butterflies, and rivers swarming with strange, small toothy creatures. Oscar soon comes face to face with three witch sisters and it is his relationships with these women that form the core of the story. I felt the movie did a commendable job of slowly unveiling the witches’ true intentions and using Oscar’s character flaws as a catalyst for one of them to become the Wicked Witch of the West. Joining him on his quest to destroy of the evil witches are Finley the Flying Monkey - who is one of the movie's highlights - and the Little China Girl, the only survivor of a Wicked Witch attack on China Town, a land where everyone is made of, you guessed it, fine china. Along the way, Oscar learns how to be a good man and realizes that maybe power and ultimate wealth are not the most important things in the world. For me, I enjoyed the movie somewhat. It wasn't the kind of movie that would have me raving about it, but I suppose this movie will appeal mostly to children. Do note the movie contains scary attacks by fanged flying baboons that test the outer limits of the PG rating - this being a Sam 'Evil Dead' Raimi movie after all - but the jump-in-your-seats bits are not overly done. I think both Ash & Ayd would enjoy the movie as they would identify with the main theme of the story. They are heads over heels in love with LEGO Ninjago at the moment, in particular with this Great and Powerful ninja known as the Green Ninja. He is a legendary ninja who is destined to defeat evil in order to save the world. And through it all, he must learn how to stay true to oneself so as to realize his hidden potential. Just like Oscar Diggs, no? As for me, what did excite me about the movie was the subtle nods to the classic 'The Wizard of Oz' film. There are lots of throwback references to the 1939 film... like when Oz first arrives, he’s awakened by snow just as Dorothy and her pals were in the poppy fields (which also feature here). Glinda kisses Oz on the forehead, much like as she did for Dorothy. Even the Cowardly Lion gets a quick cameo here, as with his “something’s got my tail” gag being repeated here, with a slightly different variation. All in all, 'Oz The Great and Powerful' isn't the sort of movie that's in any danger of making my must-see movie of the year list, but it is an accomplished bit of film fantasy, and I encourage any families who are starved for a worthwhile film in the theatres this coming March School Holidays to catch it. For a chance to win 'Oz the Great and Powerful' movie premiums, take part in the 'Tweet to Win' Contest now! For more details, LIKE the Disney Studios Singapore Facebook Page, FOLLOW Disney Studios Singapore Twitter account, and SUBSCRIBE to Disney Studios Singapore YouTube Channel. “Oz The Great and Powerful” is produced by Joe Roth, with a screenplay by Mitchell Kapner and David Lindsay-Abaire. Grant Curtis, Palak Patel, Philip Steuer and Josh Donen are serving as executive producers. “Oz The Great and Powerful” opens in Singapore theaters on March 7, 2013.